I have been doing this show for over a decade, growing each year. I now have a home in Tucson. One main reason is, just for this show. I store a lot of inventory in Tucson now. I just shipped 400 pounds of fossil mammoth bone and fossil mammoth ivory. This year I have a 12 foot tusk. I have a separate perfect smaller tusk, with half the skull, and two teeth from the same animal as a display. 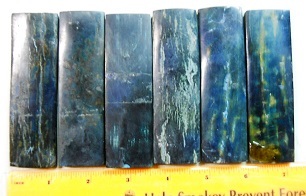 I have a lot of knife scales in the rough, bones of all kinds for display or carving, selling both retail and wholesale. I specialize, as I always have, in Alaskan raw materials, and art I do myself. I have Alaska jade, Nowitna River agate, and many stones not known anywhere else, for those who want cool stones few people have for unique display or material for your own art. I have a loot of Alaska wood this season, birch willow alder poplar and diamond willow, not well known outside Alaska. I have 7 of my books, and hopefully my latest Book 8 will be in print by show time. I began in 1972 with Book 1, "Going Wild," and have written the series that has taken a lifetime. The books make a nice companion to go with the art and materials, showing authenticity and knowledge of how the work is done, where materials come from, how they're worked, etc., as well as just a good wilderness read. I am the source for these Alaska materials, I found all the fossils, so I'm able to tell the story behind the material, offer pictures etc. I can also offer the lowest prices since I am not a middle man. I use all these materials in my own art so can answer question on how to use them. Sometimes I trade for materials that I can use in my own art and custom knives. I have knife supplies, including custom cast guards that I carve and cast myself at production prices. I run a web store, so can be contacted all year round. For now, I'll be spending 3 months in Tucson, the rest of the year in Nenana, Alaska. Come see me at the Fossil & Mineral Alley at the Ramada Hotel in Room 127!